X's and O's of football are often times discussed without solution. That is why when something makes as much sense as Robert Griffin III matching up with a Mike Shanahan offense, we should all salute a team that can pull it off. In June, we spent quite a bit of time explaining why this should be a major fear for the Cowboys and all other NFC East foes, and those threats were on full display for all to see on Thanksgiving Day. The two biggest plays the Cowboys have conceded in 2012 happened on this afternoon, and one was off the beauty of a simple classic conflict that the threat of what could be ends up being the reality of what is. Here it is. Washington in Shotgun 21-personnel, which allows them to sit in the shotgun and still be run-heavy. It is 1st and 15 and the Cowboys have dedicated the front 7 and an additional safety in Gerald Sensabaugh (who is on the top half) walking in to show an 8th in the box. The idea here is to pass in a run situation. When the linebackers and safeties are thinking run, it gives huge opportunities down the field against only a few defenders. This, you might note, is the exact opposite of the Cowboys current situation where they are trying to pass after declaring pass (lining up in Shotgun every play with 11 personnel) and facing a secondary that is filled with 7-8 defenders. In the blue circle is Danny McCray, who will be the player who Griffin is watching on the play fake. All he needs is a forward movement from McCray to know that his play is up top to speedster Alrdick Robinson. What makes the run fake so potent is that Alfred Morris has been running very well to this point, including the last play from scrimmage which was a 10 yard run for Morris. The Cowboys are now focusing on stopping the run, and on 1st and 15, they are anticipating this to be a great spot to run again. Griffin delivers a fine play fake, and the Skins send Pierre Garcon on a dig route that he runs in front of the safeties at about 15 yards. Below, see Sensabaugh step forward and Robinson pass by McCray who has already lost him at his original depth. Once McCray took a step forward, the odds of him being able to reverse direction and catch a sprinter in full gallop was completely gone. It is all predicated on the threat of a run. If the linebackers and safeties mind their responsibilities, then you will have to lay it off to Morris or the tight end in the flat. Garcon is drawing the safety over the middle and Robinson is doubled up top. The issue with doubling up top is that someone has to make sure he doesn't get behind your last man. And that was solved with the fake. 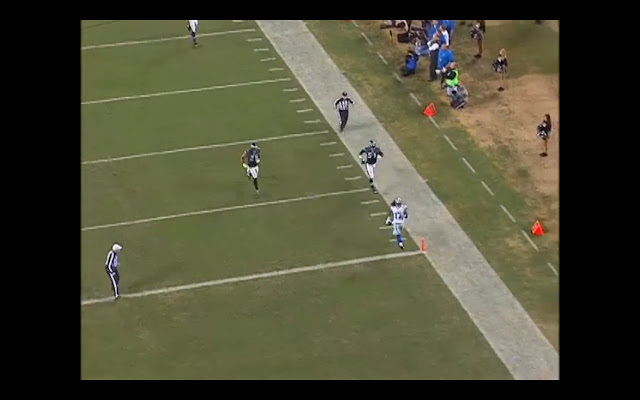 In this picture, as Griffin is in his windup, Robinson is already 5 yards clear of the closest man. 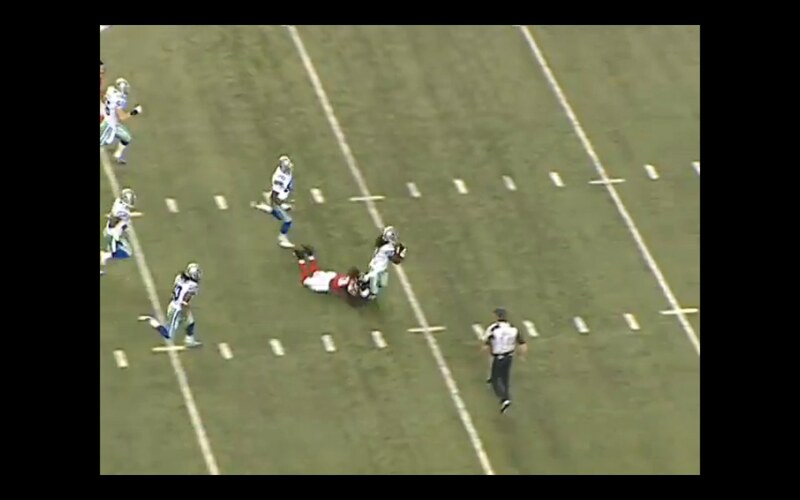 All RG3 has to do is throw the ball as far as he can and this will be a Touchdown if it isn't dropped. It was the longest play that the Cowboys have given up all season long, and frankly, one of the simplest concepts in football. Play action only works when you run the ball. And, some would counter with this truth: running the ball is much easier when you have a QB who can do what Griffin does. So, we arrive back at balance. The run sets up the pass. The pass sets up the run. The defense is spinning in confusion and the offense is dictating the football game. For once, what looks so simple on the white board is equally as simple on the field. And the Redskins are doing it on a semi-regular basis now. Just wait until they get more pieces together. 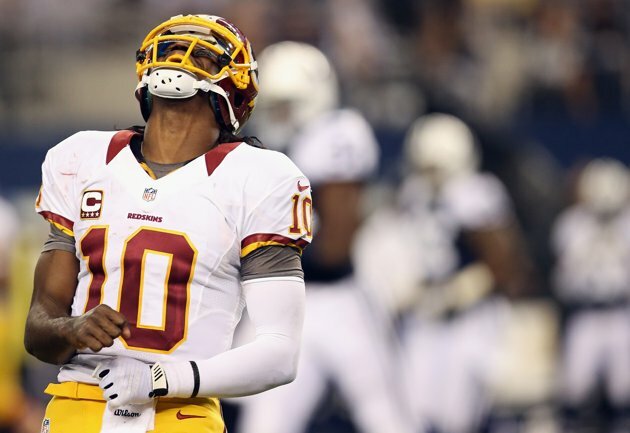 The Redskins have already scored 30+ points as many times in 2012 (5) as they had in 2007-2011 combined. Let that sink in. 30+ points in 11 games as many times as they had in 80 games. There is a new dawn in Washington and it is strictly based on a scheme and a player that fit so perfectly together. From a positive standpoint, as we declare the chapter and verse of all of the splash plays from Thanksgiving, it seems like a good idea to focus a bit on the play of Jason Hatcher in 2012. It was absolutely vital that he stepped up and played better this season, and on this day, it seemed that Hatcher was just about as unstoppable a force as the Cowboys featured on the entire defense. Hatcher had just 13 splash plays last season and already has surpassed that number in 2012. He should generally get favorable match-ups next to DeMarcus Ware and seems to be working off the stunts and end-tackle games better than we have seen in a long, long time. As you look for things to get excited about this season, I would suggest the play of Hatcher on the defensive line is one of those items that you can latch on to. And the fact that he is on the books in 2013 at a very nice cap number ($2.8m) is one position you don't have to worry too much about. Up to date season standings - thru 11 games. It is worth noting how Anthony Spencer has come on and has now almost caught Ware. If you factor in debits for penalties and games played, you might make the case that Spencer has been the superior player. For most of 2012, the Cowboys have hardly ever blitzed and hardly ever been burned because of it. But, on this day, they will rue the play Pierre Garcon made on them to punish them for blitzing 5 and not getting home. The other big play, the TD to Niles Paul, was not so much a blitz as it was a short yardage sell out to stop the run and then a painfully blown coverage behind it. Not exactly a traditional blitz, but nevertheless, they were burned. 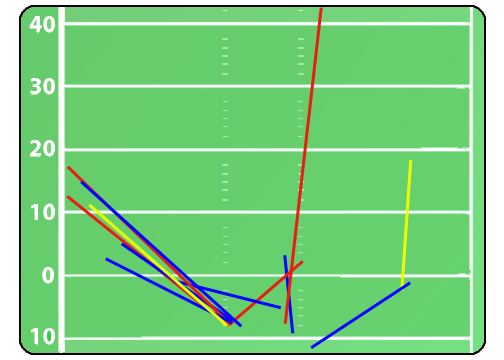 And, here are their four sacks, none of which were generated off of the blitz. It is a bit misleading to say there were 4 sacks, given that Griffin appeared to be running on 1 or 2 of them, but they were scored as sacks so we will roll with that. Just a tough day for a defensive unit that has had a pretty good season. They are beginning to lose more and more key players and are trying to hold things together. The attrition is leading to more backups and out of work free agents altogether. That leaves to a more vanilla approach, but it is pretty clear that they cannot be what they were conceived to be back in the summer. And that, is something I believe we say about this time of year just about every year. Injuries show your depth or lack thereof. * - They continued to score next to nothing before halftime, as they found just 3 points on Thanksgiving Day. To date, the Cowboys have scored just 73 points in the 1st Half through 11 games, or 6.6 points per game. That ranks 30th in the NFL (Yes, they are actually ahead of two other teams! Kansas City and Philadelphia) and a real mystery given that they have scored 169 in the 2nd Half (3rd in the NFL). * - They continued to draw all sorts of penalty flags (7 more), and while the number is actually down by their season standards that show them the most penalized team in the league in penalties called and 2nd most in penalties accepted, the 7 they had on Thursday were particularly costly as they halted 2 drives early when the game was still very much in doubt. * - They continued to have a comical time in a normal offensive formation, running just 12 plays from under center for a demoralizing 31 yards. This is a trend that seems to have gone further and further down hill, even when we thought it to be impossible. The game before, against the Browns, we accused them of being painfully out of balance. But, in that game, they snapped 24 plays from under center. This time, they showed us something even more out of balance: 12. When you run just 12 plays from under center, you simply have given up on traditional offensive concepts. And with it, your personnel becomes predictable, as do your intentions. Your 2nd tight end played 9 snaps. Your 3rd tight end played 2 snaps. Your full back played 17 snaps, partly because he is the only guy on your roster you trust in blitz pickup. But, here is the biggest reason that playing from exclusively shotgun is a horrible idea (if there is any other choice). The opponent knows exactly what you want to do. And, they, being critical thinkers, make you do things you don't want to do. They saw against Cleveland that you were willing to take shots down the field and test your protection and your QB's ability to deal with 7 man coverages. 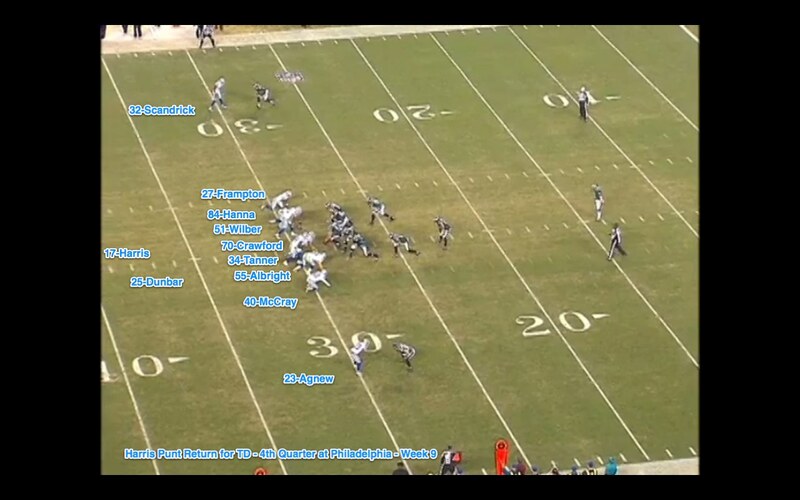 So, Jim Haslett countered by firing up multiple blitzes and coverages. He mixed them up and showed 7 men at the line of scrimmage over and over. Then, he either brings them all or drops them all, making your QB do mental gymnastics. Meanwhile, across the field, the rookie QB for the Redskins can show a play-action fake and get all of your linebackers and safeties to step forward to stop the run. Then, he drops a pass over the top against a corner who has no safety support anymore. 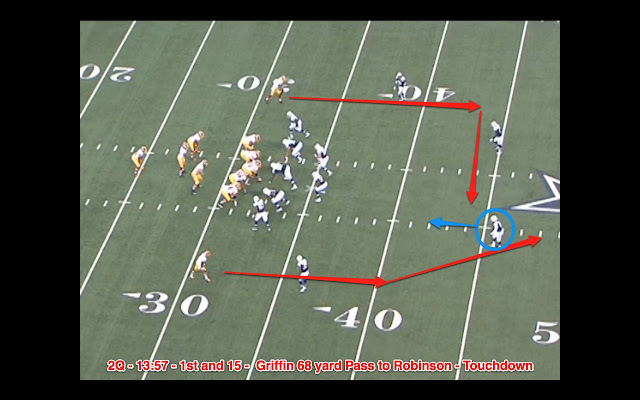 Griffin, for all of his greatness, will throw largely against 4 man coverages. 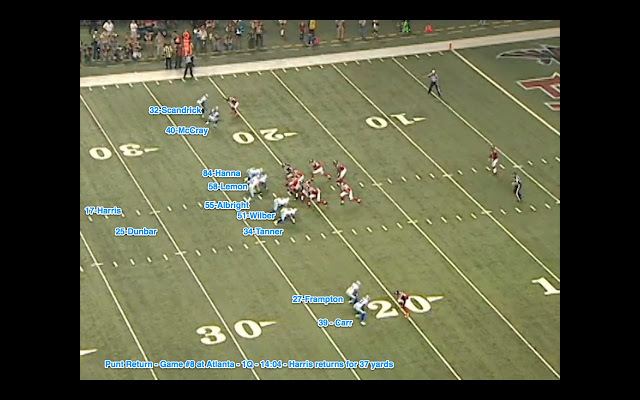 Romo must deal with 7 and sometimes 8, with Dez Bryant and a host of young receivers. There is no mystery. There is no deception. You have become a team that must receive snickers when you try play action. What is the threat? Why would a safety care that you faked a handoff to Lance Dunbar or Felix Jones? Where is the fear? There is none. And that is why this offense is as broken as I can ever remember. And now, they don't even believe they can fix it anymore. They are simply just trying to win, while knowing that they are trying defy all football logic. Trying to pass when the opponent knows you want to pass is very difficult in the NFL. It gets even harder if you aren't one of those rare offenses that have match-up issues everywhere. The Cowboys have Dez Bryant who consistently can hurt you, but that is quieted with a safety placed over the top. Other than that, it is either a number of 7 yard receptions to Witten or it is time to force the ball into Cole Beasley or Dwayne Harris. Here are the numbers for the last 5 seasons for the Cowboys running game from under center. Under center numbers are important because that is the very foundation of your balanced up offense. Are you running or passing? The linebackers and safeties must respect both. If they cheat one way, you punish them the other way. This is fundamentally sound offense. I had to do a double-take when I saw 2011's numbers of 4.63 yards per carry. It was way better than I recalled, because I left 2011 feeling like the offensive line was a major weakness (because it was). But still, in that very good year by Dallas standards, the Cowboys still rated 18th in the league in rushing yards. That's right, a good year for the Cowboys running game under Jason Garrett is still in the bottom half of the league. Since 2007, the Cowboys have run the 28th most running plays in the NFL with 25.7 running plays per game. That ranks them higher than 2 teams that are passing kings: the Colts and the Saints and 2 teams that cannot run and have stopped trying: the Cardinals and the Lions. Also, there have been 13 games under Garrett (since 2007) when the offense has gained fewer than 50 yards rushing. It happened once in 2007. Once in 2008. Once in 2009. Three times in 2010. And 2 more times in 2011. The other 5 times have all been this season, and this is a year where the Cowboys have only played 11 games! And for those arguing that it can be traced back to DeMarco Murray's health, well, actually, he was your running back in 3 of the 5 games in which the Cowboys have been under 50 yards. Now, they have stopped trying altogether. It is not a priority and it is not emphasized. But, 2012 has taken it to an all-new low, where they try just 18.4 runs from under center a game, easily the lowest ever. And now, they have a battered receiver group and the pass protection is a mess. At 5-6, they are still alive mathematically, but it seems to be but a pipe dream. Again, I have no idea how much of this data is worthwhile if the Cowboys are going to run offense like this, but it wasn't the score that put the Cowboys out of balance on this day. In fact, it might be the other way around. It might be the ineffectiveness when they are trying to find balance that is leading them to fall so far behind in the 1st half of every game. Then, when the scoreboard and/or the frustration level gets high enough, they switch to Shotgun-11 personnel and try to sling it around the rest of the day and accumulate huge (and hollow) numbers. Notice that the downfield throws of Cleveland were not as available with Washington planning for them and countering with either deep coverage or hurried blitzes. This offense that the Cowboys are relying on is not easy to defend if you are playing with a lead - Especially a 25 point halftime lead. 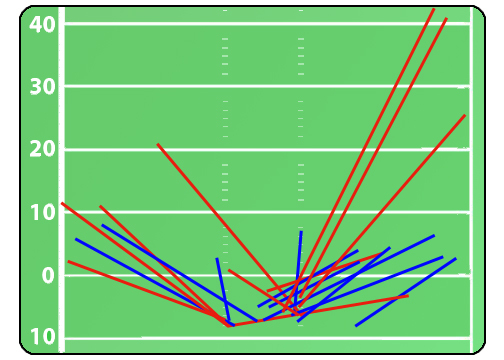 It might be easy to examine these charts most weeks, but the sheer volume of his throws make this quite a maze of lines - with the blue for completions being a number of underneath throws against what amounted to a very conservative prevent. 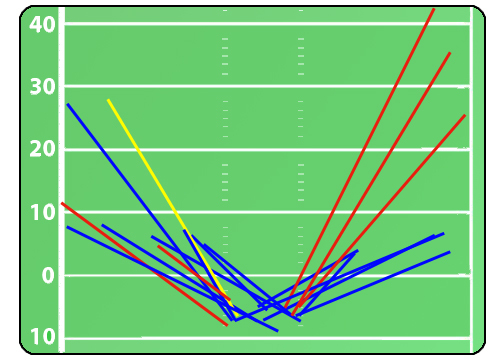 Another very productive day for Bryant, but this time his 145 yards were largely found on his 85 yard touchdown on the yellow line down the right edge of this sheet. He is on a roll, and yet defenses are making him work hard for his catch. If there is a redeeming value of 2012, it might be that he is learning how hard it is to be a #1 receiver, and yet he is still working hard to achieve it. * This statistic doesn't count the 1-play kneel down drives (there are 4 so far this year). As you see below, somehow the Cowboys have reversed traditional thinking (for the worse). Usually, playing on the road has not been efficient for the offense. But, for unknown reasons, the offense is operating out of shotgun at 36% on the road and 67% at home. This must easily be the largest contrast in the sport. If anyone has any theories why they can balance up their offense away from the stadium, but are routinely unable to call and plays at home, leave your theories below. And here, we see how yardage numbers and most statistics can be taken out of context if we don't watch the game. Just by looking at the box-score, you would think the Cowboys offensive was ultra productive. If you watched the game, you know that most of these yards and points were a result of the Redskins playing far more conservative defense later in the game because they had a gigantic lead. This is getting a bit repetitious, but I think it still needs to be the focus of our study until things change. And when, exactly, will things change for this offense? Well, it might not change in 2012. You would think if the brains of this operation had any better ideas than what we have seen in the last few games, we would have seen them by now. And with attrition taking its hold of the roster, this is hardly the time to expect creativity. They are in full survival mode now, just trying to scratch out wins any way they can. For much of the United States, Thursday was a day where many tried to remember what they have and to offer thanks for those many blessings and fortuitous circumstances that they are afforded. For the Dallas Cowboys, it was a day to look in the mirror and to see how far they are from being the team they fancy themselves being. It doesn't appear that they are as close as many had hoped. In fact, the reality check that Washington dropped on the heads of the Dallas Cowboys in front of a national audience told a story that could make one panic, realizing that the Redskins may have found their "chosen one" to lead them out of the same football wilderness that the Cowboys are stuck in. The show Robert Griffin III was able to perform on Thanksgiving 2012 may have rivaled the 1998 Thanksgiving clinic that Randy Moss devastated Texas Stadium with for best shows by a visiting rookie in these holiday classics in DFW. That may seem ironic, given that like Tony Romo's career-high 441 passing yards yesterday, Troy Aikman had a career-high 455 passing yards on that day - as both were spending the entire afternoons trying to mount a rally that never fully materialized. However, it did rack up huge passing statistics as a reminder of just how hollow those passing yard totals can be. If you pass for over 400 yards in a game, chances are really good that your team got destroyed on the field when the game was in doubt. And yesterday was no exception. The Cowboys started the game with some reasonably positive vibes as the pass rush was active and the offense marched. But, the opening drive stalled when another red zone penalty was committed by Jason Witten and 3rd and 7 became 3rd and 12. That 3rd and 12 was nearly converted as Romo hit Miles Austin on the dig route, but Austin was unable to secure the ball before London Fletcher blasted him right out of the game. The Cowboys had to settle for 3 and although Austin would play one more snap, he had suffered yet another injury on his long list of ailments and the Cowboys would have to play the rest of the game with Dez Bryant and their deepest WR reserves the rest of the way. The 2nd Cowboys drive - the rarest of birds, a Cowboys drive in a home game where they had a lead - was also sabotaged by the ridiculous back-to-back penalties on 2nd and 5 that marched the ball back to 2nd and 15. First, it was a false start on Doug Free, but then, the unthinkable: A delay of game penalty after a false start penalty? How in the world does that happen? They called the false start penalty on Free at 3:26 of the 1st Quarter and then started the clock. It is only a 25-second play clock, but every player is standing right there and presumably, they were running either the same play or one that did not require any personnel changes. So, why, with 3:02 left is Romo shouting "kill, kill, kill" and trying to get the ball snapped with panic as the play clock turns to :00? How could you have a delay of game in that scenario? This is just not a team that executes their duties well. That drive ended in a punt, and even though there was 1:44 left in the 1st Quarter, it would be the last time they would take a snap with a lead all day long. For, Griffin was about to engineer the biggest play against the Dallas defense of 2012. 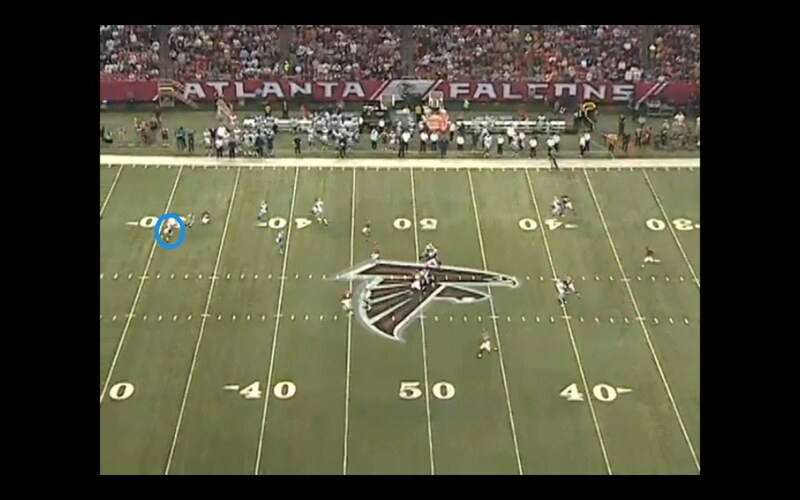 It was 1st and 15, as Aldrick Robinson had just committed a false start penalty for the Redskins. This allowed Aikman to share the back-story of Robinson with the television audience that took the Waxahachie High School product through SMU and his terrifying speed. The Redskins then faked an inside handoff to Alfred Morris and went max-protection to give RG3 time and space to look for his 2 potential targets; Leonard Hankerson underneath or Aldrick Robinson over the top. 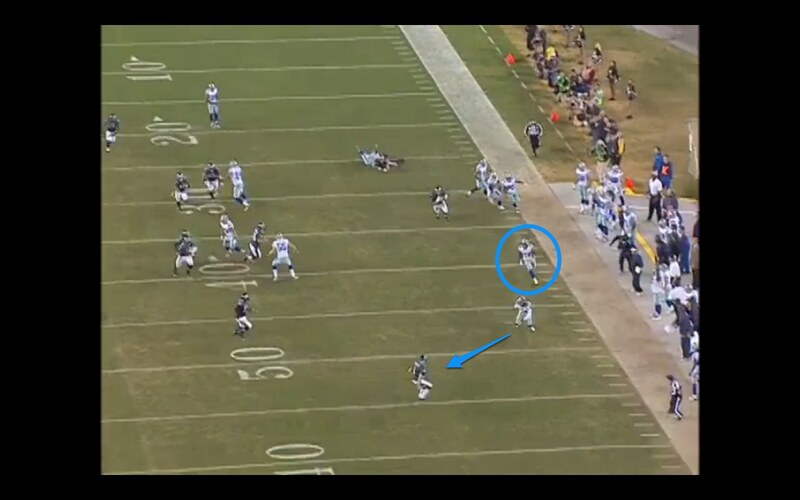 One would suspect that since Robinson just went over the top 4 days ago against the Eagles for a touchdown on a similar play that this was noted over and over again in the Cowboys meetings to the safeties, and yet, that inside fake to Morris got reserve safety Danny McCray to take those fateful steps forward. 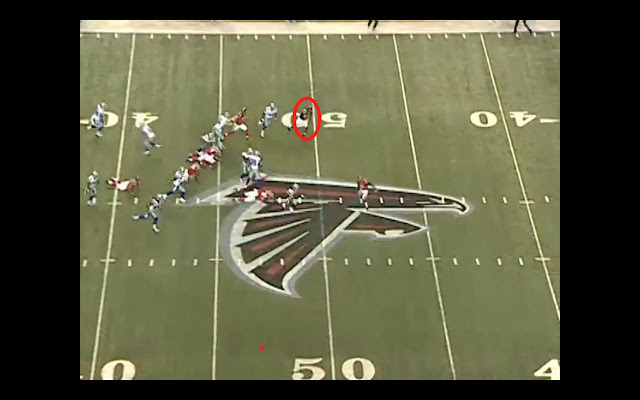 As he does that, Robinson takes his sprinter's speed right past McCray on his way downfield. Griffin launches a pass that travels 60 yards in the air and lands in the hands of the Mustang who is roughly 10 yards clear of the nearest Cowboys defender. Touchdown. It was the first of many and the Cowboys would play from behind for the rest of the game. The Cowboys played their 5th home game of the season yesterday. In those 5 games, they have held the lead for just over 24 minutes of possession. When you consider that 18 of those 24 minutes came against the Tampa Bay Buccaneers in the 1st home game, that tells you a story that would make any expansion team shudder. In the second home game - against Chicago - the Cowboys had possession of the ball with the lead for 0:00. Chicago had 16:15. In the third home game against New York, the Cowboys had possession of the ball with the lead for 1:08, while the Giants countered with 17:20. In the fourth home game against the Browns, Dallas had the ball with the lead for 1:16, while the Browns had the same situation for 17:54. And then yesterday, Dallas actually had one full possession with the lead for 3:46. Washington played the final 3 quarters with the lead the whole time for 23:55. In total, that means the Redskins on one day had the lead at Cowboys stadium 13 seconds less than the Cowboys have had it ALL YEAR. They have 6 minutes of possession with a lead in their last 4 home games. You can take every other statistic from these games - including the 1,781 passing yards Romo has put up largely when the team has trailed big - and table them. This is all the sign that you need that we are deluding ourselves if we think this team is close. If that total doesn't stagger everyone associated with this franchise, I don't know what will. They never have the lead in games they play at home. And they never have leads because their offense cannot function at even a reasonable level of performance. If there is even one mistake - just one - it seems that the offense cannot overcome it. 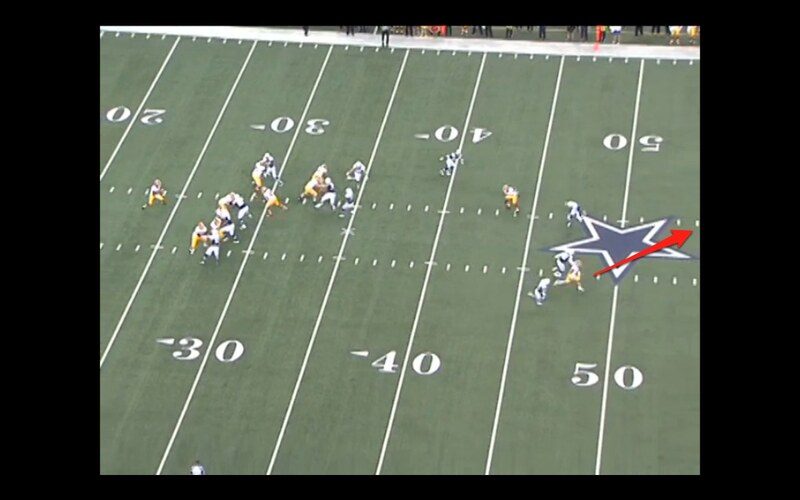 But, the ensuing drive after the long touchdown to Robinson had the Cowboys on the march. Until, Josh Wilson put his helmet right on the ball in the arms of Dez Bryant, and the fumble put the Redskins in a great position to find distance between the two teams. And with no Jay Ratliff, Sean Lee, or Kenyon Coleman due to injuries, the Cowboys could not stand up to the inside running game of Alfred Morris. 24 carries for 113 yards, including real nice 1st down numbers where the Redskins constantly stayed ahead of the chains. This is made possible because of fakes from Griffin that freeze DeMarcus Ware and Anthony Spencer on the outside because of the real threat of RG3 keeping and getting into the open field if they don't protect the flanks. After a week of hearing from many readers complain about how much hype Griffin is getting, I imagine now it was on full display to everyone in Texas that their greatest fears have come true. Washington has a difference maker at the most vital position. It has been many moons since this was the case, but if you were ever going to overpay in a trade, you would do it for that player at that age at that position. He seems worth any price when you see how he can take over a game and stay out of trouble for almost his entire rookie year. And that is what makes Washington scary moving forward. Sure, they are 5-6, just like Dallas, but it seems that RG3 puts them in a spot where when they get health back and continue to build with a GM in Bruce Allen who knows how to build (notice the owner is making fewer decisions in the last few years in Washington) and a coach who understand a little something about winning, that they may finally be on their way out of their football wilderness. But, what of this team that we follow? It seems that there is almost nothing the offense does well. What is their identity? What is their calling card? Or their go-to strength? And how much of it is health related and how much of it is simply a house with a really bad foundation that might need a bulldozer to truly fix? They battled back yesterday, like they always seem to do. They have guys in this room that want the same thing everyone wants. But, desire only takes you so far. At some point, you have to have someone who can read a map helping you navigate out of this desert. And with repeated self-inflicted wounds and moments of madness like a QB sneak on 1st and 10 because they thought it was 3rd and 1 (this really happened at 4:50 left in the 3rd Quarter) and another moment where the defensive coordinator has to convince the head coach to challenge a play where it otherwise appeared they were going to allow an absurd spot of the ball, it makes you wonder. It makes you wonder about pretty much everything that this organization is about right now. They are building, but are they using the right plans? Are they demanding accountability and progress? Or are the simply running just to stand still? Before the game, yesterday, there were snickers in many circles about these two rudderless franchises squaring off on Thanksgiving Day. It was the two owners who constantly change philosophies like a bottom feeder in your fantasy football league, all while making sure the public was aware of who was in charge. Jerry Jones versus Dan Snyder, owners who run two of the most valuable sports franchises in this country and will not be outdone in the all-important category of maximizing income. But as one of them was bringing us an sparkly half-time show that looked like a very successful concert in a palace of entertainment, the other was up 28-3 on the scoreboard, and appeared to have understood the idea that if you cannot read a map, perhaps you should hire some people who can. And now, the Redskins appear to be potentially on their way up the standings in the years to come. And the Cowboys? Well, the Cowboys had Kenny Chesney play halftime, Kelly Clarkson sing their team anthem (who knew a team had an anthem? ), and may host the biggest fight in UFC history next year at their stadium. 10 games into the season shows us a Cowboys defense that is starting to feel very good about itself. They are forging an identity and certainly are enjoying playing nearly every rookie QB in the league it seems. The test on Thanksgiving will certainly be a different brand of rookie QB from the Russell Wilson, Nick Foles, Brandon Weeden attacks, and with Robert Griffin, they will get a player who is putting together a historic rookie season from many standpoints. He is poised and confident in his reads, and as anyone who follows the strategy in the game closely knows, he loves stressing the defense in ways where there are never enough defenders to cover everything. So, what have we learned from the Cowboys defense? Well, we have learned that their plans of last spring have not been followed, because of health and issues related to attempting to prevent catastrophe from their defense. Jason Garrett and his staff have certainly perceived that the offense is causing all sorts of management issues, and it is up to the defense to not add to the problem. In the spring, they acquired what they felt were elite corners at elite cornerback prices and the word quickly spread that this would allow them to play "press coverage" way more often and to occasionally unleash some of the exotic blitzes that the Ryan family is noted for. They would attack more and this would lead to more explosive splash plays from the defense without the obvious downside of such a strategy - getting ripped to shreds by big plays that the blitz exposed. Blitzes are no fun when you are getting badly burned behind them. But, the spring time plans hit an early iceberg when Sean Lee was injured and lost for the year in Carolina, just a few weeks after starting safety Barry Church was also lost for the year. These 2 starters in the middle of the defense were replaced by players who were certainly not thought of as particularly strong cover players in Dan Conner and Danny McCray. Although Conner has been replaced himself by Ernie Sims, it is clear that the aggressive posture of the Cowboys has backed off considerably when it comes to sending extra players in a pass rush to try to bring pressure. 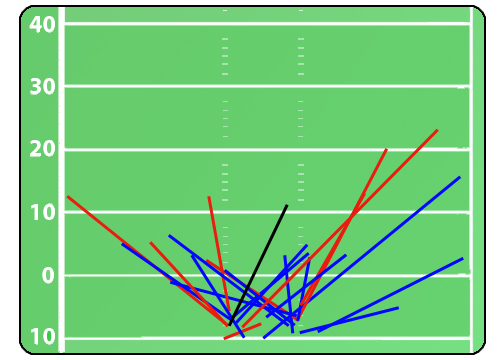 Now, when they lost Church and Lee for the year, notice how much more conservative the blitzing became. Also, note that Spencer returned and Ratliff returned, perhaps telling the Cowboys they could get more pressure without bringing more men. That is a staggering personality change. Hopefully, those 2 charts are rather easy to see. Basically, the Cowboys have stopped rushing 5 or 6 (a conventional blitz) and converted almost all of them to a 4 man rush. What used to be 37% blitzing is now 14% and the explanation that we arrive at appears to be less confidence without Sean Lee and the returns of Ratliff and Spencer. To the credit to the defense, we have had very little complaints about the defense over the last 5 games, but the personality has changed dramatically. In fact, we saw a ton of 3 man rushes in on 3rd down on Sunday, making fans even more annoyed about the lack of a pass rush. The man who really stole the show this week was Anthony Spencer again. He missed a handful of games early in the year, but since returning against Carolina, he has been fantastic. He had 5 splashes in this game - including 3 in one single snap where he sacked the QB, knocked the ball free, and then fell on the ball. That led us to ask the question of how many would be the maximum number of splashes possible in one play? I think 4. Those 3 and then a return to the end zone with the ball to make it 4, although I don't recall having ever seen that in Dallas in the years I have tracked this statistic. Up to date season standings - thru 10 games. After the Baltimore game, DeMarcus Ware had 13 splashes and Anthony Spencer 8. Since then, Ware has still be excellent with 11.5, but Spencer has actually exceeded the great Ware, with 13.5 of his own. Spencer has really been great. If he can continue that play against Washington, we will really have a story on our hands. And, here are their two sacks, neither of which were generated off of the blitz. We will continue to track these numbers, but as it currently stands, it seems that Ryan and Garrett have a rather sound philosophy which gives them a chance to stay in games while the offense sputters. It makes plenty of sense to continue down this path since the defense is managing to hold its end of the bargain high. However, the tests get considerably tougher in the final 6 games with 2 games against RG3, a date with Pittsburgh, another with the Saints, and a few other games where they will need that defense to make a play to save the game. As the Cowboys navigate past the 10 game barrier in their season and in to the stretch drive, we now have enough data to begin to learn about this team based on what they do well and more importantly, it seems, what they don't do well at all. We know that this team has the fewest 10 play drives in the NFL. Of the Cowboys 112 drives, only 11 have lasted 10 plays. That is lower than every team in the league, with the league average at 17 and the league leaders up at 25 (New England). This statistic doesn't go well with the previous one, but the Cowboys also have the worst starting field position in the league following kickoffs. In fact, they are the only team in football that doesn't at least average the 20 yard line after kickoffs (19.8). That stat is amazing, and if you always have long fields and cannot string long drives together, that is a horrid combination. Other horrible characteristics of a 5-5 team include being 2nd only to Washington in "Penalties Accepted Against". Washington has been called for 88, Dallas 83, and the league average is at 64. What is worse? Dallas has actually been called for 97 penalties, while Washington has been called for just 95. So, if you count those flags that have been declined by the opponent, the Cowboys are the worst in the league. Another statistic that is tracked in the league that Dallas does poorly in is rush percentage. This statistic tracks your run play percentages and it gives us a look at which teams are able to run the football and which are not. Of course, as a game develops, score can often dictate play-calling, and in the end, this stat doesn't always paint a full picture. But, 3 of the top 4 running teams are Seattle, San Francisco, and Houston - also 3 of the top 4 teams in performance this year. Washington and Kansas City also run the ball a ton, too. Fewest runs? Oakland, Detroit, Arizona, New Orleans, and Dallas. The Cowboys have run the ball 233 times this season in 661 plays for a run/pass ratio of 35/65. Seattle is #1 at 55/45 run/pass on the year, and that hardly surprises anyone. And the Cowboys are 32nd in average yards per run. 3.57 is 32nd of 32, which verifies the decision making in a league where the average run is 4.21 and the league leaders are at 5.48 (San Francisco). So, they seldom run the ball, and when they do, they run it for the shortest gains (and often pick up penalties). So, if you ever wanted to understand why this offensive line is thought of as being absolutely sub-par, there it is. Then, in pass protection, evidence is a bit more difficult to confirm, because as I have written a number of times, a coach can tailor his offense around poor pass protection. It is a choice he must make to coach to avoid sacks or coach to push the ball down the field. If he calls short passes, there will be almost no sacks because those routes take less than 2 seconds. But, if a route is down the field, he needs pass protection which then can lead to sacks. And that is why I think we have seen a change in attack from Jason Garrett and Tony Romo. Whether they maintain this stance on Thursday will be telling, but I believe that the two decided (likely after the Atlanta game) that they must risk the QB's health and OL's pass protection skills and begin taking more shots down the field. The conclusion must be that their offense was just not creating any plays because they were being so careful and avoiding risk (See: Garrett Risk Aversion theory). They weren't running the ball without DeMarco Murray and they weren't getting anything but short passes to protect the QB. 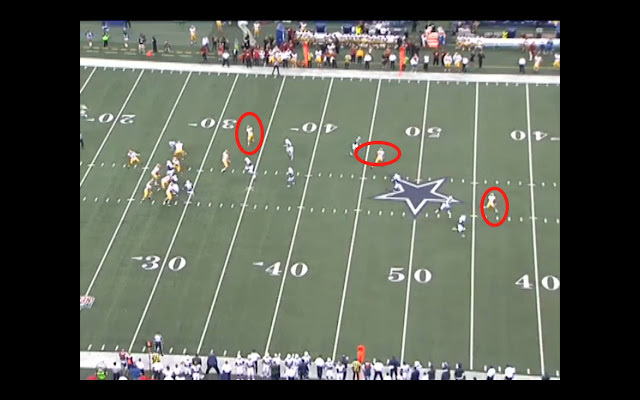 So, they were trying shallow routes, but the defense was sitting on these short routes (since they scout Dallas) and this led to smaller windows and the chance for more interceptions. There was only one chance this team had to make the playoffs: Scrap the caution in the passing game. At least until Murray could return and possibly restore balance, they would have to do 2 things. 1) stop trying to have balance and 2) start throwing the ball down the field more and back off the secondary. Throw the ball down the field. Test the pass protection. Take some hits. And ask Romo to make things up on the fly and win the game himself. One mistake might be too many, but they clearly decided that nothing else was working. Murray has been out since the Baltimore game and I hesitate to call him a savior of any sort. It was my belief that he was losing confidence quickly after the horrible experience in the Tampa Bay and Chicago games that included an absurd 18 negative runs in 29 carries. And as you may recall, he tore up the Ravens defense early but then has been lost since halftime of that game back on October 14th and the Cowboys haven't seen him since. After that, they played Carolina, New York, and Atlanta and the offense never looked strong. But, in the Atlanta and New York games, they did find some small success when they scrapped their balanced offensive philosophy (under center/shotgun and run/pass) and just went into their full 2-minute drill offense. It was a small sample, but I believe it led to this conclusion. In the 5 games since Murray has been missing, the Cowboys have gradually thrown caution to the wind and despite the fact that it is not fundamentally sound, have become more and more interested in a straight shotgun offense. The results? In 146 snaps in "Shotgun 11" personnel, they have gained 965 yards, or 6.61 yards per snap. In the 178 other snaps since Murray has been gone, they have gained 759 yards, or 4.26 yards per snap. Knowing the league average for yards per play is 5.44, you can see how telling these stats truly are. In the 5 games, their S11 has averaged 6.3, 6.3, 10.1, 5.3, and 5.2. Meanwhile, every other package combined has averaged 4.4, 4.3, 3.4, 5.6, and 2.5. That is right. 2.5 yards per play in 29 snaps against Cleveland for everything that was not S11. It is not efficient. It is not challenging for the defense at all to defend. It invites more blitzes and more pressure on Tony Romo. It doesn't stress the safeties at all. It is not smart football. It may get your QB hurt. I would advise strongly against it, and more importantly, I am guessing any coach would think it was a really bad idea. It is all they have right now that is working. Their under-center offense against Cleveland (see below) was an abomination. Garrett and Romo are likely discussing today if they should proceed down this path. The Cowboys threw more deep passes on Sunday than in any other game this year, but their QB took a beating. Was it worth it? And can they continue to play with this fire? They might tell each-other that this is just until DeMarco can return next week (hopefully). But, they also have to stay alive so his return actually matters. They are clearly playing with fire, but I honestly am not sure they have a choice. Notice all of the downfield throws. This has been missing for weeks. 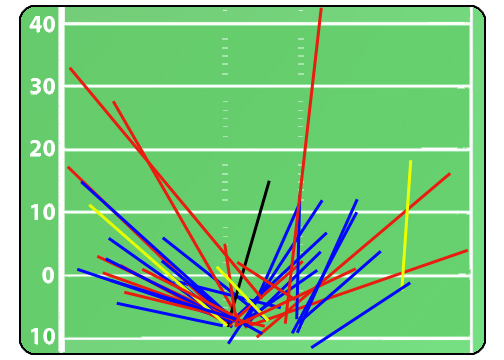 And each throw of that distance requires Romo to take a hit or two. 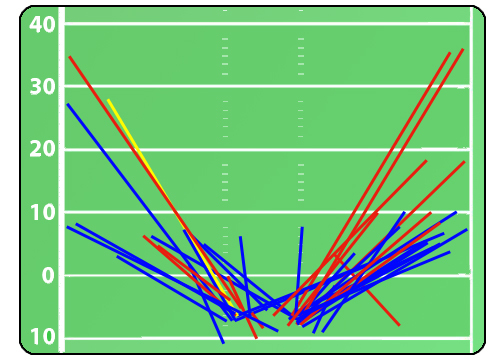 The 2nd half chart shows more deep shots, including the two deep throws they hit on to Dez Bryant. Here is a chart dedicated to the day that Dez Bryant had. 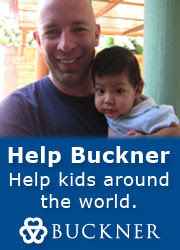 It appears he is now the focal point of this new initiative. Take risks to allow Dez to take over the game. And on Sunday, he did. Balance? What balance? I have never seen 68% before. That is insanely high. Like June Jones high. And the numbers below explain the mess. The Cowboys tried 24 plays from under center on Sunday and gained a pathetic 48 yards. This is as bad as it gets. If you want to know why they just scrapped their playbook, look no further than that. Their performance on 3rd Down was flat-out awful. 14 plays for 20 yards is ridiculous. I think we should see that Cleveland was bringing pressure and running more stunts on this money down and causing the Cowboys all sorts of stress. Even with their efficiency out of shotgun, they still need to stay out of 3rd Down and do their damage on 1st and 2nd Down. Because 3rd Down is not kind to them right now. It is as out of balance and counter-intuitive as I have ever seen. It basically tells us what we already know: The Cowboys offensive line and the injury to DeMarco Murray has made them toss everything in the trash as they simply go to a survival mode. I really doubt it can work for long, but if they can somehow get the next two home games against mediocre teams, maybe they can try to play fundamentally sound football in the final month. I am not sure I have ever seen this Cowboys offense in a more ridiculous state of desperation than they are right now. I highly doubt they (Jerry) will ever marginalize the importance of an offensive line again - but they are learning their lessons now. In the meantime, at some point, they (Garrett and Romo) had to get honest with themselves. This team has to try something unconventional to survive through this stretch. Nothing else was close to working. This is not a great option, but it might be the only one. All Shotgun, all the time. No complicated personnel switches and no play action. Why? Because run fakes don't work unless you have run success. This whole plan is one big Hail Mary that the next hit on Romo isn't his last of the year. Just hold your breath that they don't get burned. In an effort to take my own advice, I would like to remind any and all that the ugliest win in the world is better than the prettiest defeat. Also, that wins are very difficult to find in this league, so the last thing you want to do is to get picky about how aesthetically pleasing to the eye a victory might be. But, wow. Nothing comes easy for your 2012 Dallas Cowboys. And they proved that by needing nearly 70 minutes to take down one of the least frightening teams in the entire league. At home. In a critical matchup. Before we get to the countless concerns that this team seems to have right now as they frantically prepare for their next nail-biter in 72 hours time, let's say something extremely complimentary about this crew under Jason Garrett: This team competes hard. I am not sure every reader will agree, but having watched many Cowboys teams over the years - some who played as hard as they could and some who looked like they picked their spots - I would like to report that the 2012 version of the Cowboys compete as hard as just about any team. From a perspective of "want" and "desire" and "effort" and all of those keywords that denote the characteristics of a professional earning his professional-sized paycheck, I think Jason Garrett's teams play their tails off. I know that won't make anyone forget legendary Dallas squads that have Lombardi Trophies in their possession, but in the chaos that is modern-day Cowboys football, it would be easy for teams to lose their competitive edge amongst the constant pressure, critique, and distractions of pizza and lingerie promotional events in their own stadium. Very few teams have "art tours" to navigate around, and the fact that this Cowboys team competes as hard as they possibly can on just about every play of every game is something that I don't think should be completely disregarded. Now, I will be reminded by many of you that discussing how hard a team tries is the same mentality that makes us award trophies to every team in little league sports, but I have seen several Cowboys teams quit. 1997, 1998 (in a playoff game! ), 2008 (44-6), and 2010 (Jacksonville and Green Bay, anyone?) all come quickly to mind. So, the fact that this team looks like effort, desire, and accountability are all sufficient should say something. I like that this team doesn't look like dogs and that this team looks like they play hard for their coach, franchise, and most importantly, each-other. I think their leadership is strong and the players on the roster look up to the Wares, Wittens, Romos, and Ratliffs on this team and compete like they compete. There are no questions in my mind about this team fighting its tail off until the final play has been played. I like that trait, and it might have won another game for them yesterday. OK. That is about the extent of the positives for certain parts of this team. Here is the thing about effort. It is a word defined 2 ways: "The use of physical or mental energy to do something: and as "a difficult exertion of the strength or will". So, in a nutshell, what that means is that you or I could put as much effort into playing on the offensive line of the Dallas Cowboys as anyone of the current members. Right now, you can go try just as hard as Nate Livings or Doug Free. You won't play as well, but effort? You can try just as hard. You could put the same amount of effort forth on Thanksgiving Day as anyone one of them. And that is why effort is only worthwhile if there is ability attached to it. And, to be clear, we would never accuse the Cowboys offensive line of having no ability. But, we might argue that there are very few (if any) teams that have this little ability linked together in one offensive line unit amongst the 32 teams in the NFL. Put another way, despite thinking the offensive line could not get worse than it was in 2010, they might have actually downgraded in 2011. And then we figured out that the offensive line was even worse in 2011, we felt any change would clearly be an upgrade in 2012. And I am now about ready to admit that I may have been wrong again. This 2012 version may actually be even worse than 2011 and 2010. Think about what that says. They have gone from being a weakness on this team to a unit that seems incapable of allowing the offense to call any play - run or pass - with any degree of consistency. Provided that Jason Garrett turns things over to Tony Romo so that he can attempt to escape another sack, all the while, making things up as he goes, they at least have a chance to compete. But, beyond that, they are being held back badly by the big guys up front. And, Larry Allen is not coming through that door. Yesterday, against a Browns defense that appeared to feature no pass rushers with any sort of league reputation, the Cowboys made them look like one of the best defensive lines in the league - something we said earlier in the season when the Tampa Bay Buccaneers accomplished the same feat. 7 sacks against Tony Romo is now his career high for bad days at the office. In fact, the fact that the Cowboys were not allowing a huge number of sacks seemed to get many people to believe that the team wasn't that bad up front. But, they weren't looking hard enough. The Cowboys were not allowing their line to have a chance to fail at pass protection because they were running an offense that did not have the QB hold the ball in the pocket with deep drops and deep routes for the receivers. But, see, you can't have it both ways. And when the offense was not scoring points against teams like Carolina or Atlanta, they realized that short, quick passes were not going to amass enough yards and ultimately, points to win games. But, those same short, quick passes were keeping Tony Romo from getting hit over and over again. Well, over the last two games, Philadelphia and Cleveland, Jason Garrett and Romo have decided to "go for it" a bit more with the offense. Try more play action passes that required a bit more time in the pocket. This is rather basic offensive theory. To get deeper routes, you need longer amounts of pass protection time. There is no other way around it. A receiver needs about 3-5 seconds to get 25-40 yards down the field (depending on whether they are being pressed or have a free release from the line of scrimmage and how deep you want the route). You simply must protect long enough to let them get downfield and to find open space. There is no other way around it. So, deep routes need protection. Shallow routes don't need as much, but then the defense can keep receivers in front of them and there is no explosion to the offense and ultimately, no points. Add to that this issue of a very inconsistent running game and you have most of the issue in front of you. But, wait. It get's worse. Now, you introduce attrition from injuries. Down goes your left tackle, Tyron Smith, with what could be a prolonged absence. Hold your breath on that one. Center has been a major issue all year due to health, and yet, the man who played nearly all the snaps in training camp, David Arkin, has not been allowed to take the field. This should speak volumes of their belief that he is not even close to these current low standards that are on the field. And yet, they continue to employ him. What happened yesterday could likely be a sign of things to come. 7 sacks against and a victory that required your Quarterback to take a beating again. The offensive line that finished the game; Jermey Parnell, Livings, Mackenzy Bernadeau, Derrick Dockery, and Doug Free is likely to be the line that will take the field on Thanksgiving against the Redskins. They all had moments on Sunday where you could see they were unable to handle the responsibilities with any level of passable grades. When the Browns ran the simplest of stunts, they had free runs at Romo as confused linemen looked at each-other. At times, it was flat-out pathetic. If you have followed this blog for any length of time, you know where we point the blame for this sort of showing. We have written for years that the Cowboys have not emphasized the trenches enough and have not built well-enough from the inside-out. Given the choice of a major investment on a 300 pound player versus a glamourous 200-pound player, Jerry Jones and his staff always seems to spend on small and fast, rather than big and strong. When they have a chance to put their draft resources on big players who are ready to start right away, they put all of their eggs in the Roy Williams, Felix Jones, Dez Bryant or Morris Claiborne basket. What makes it all the more difficult to understand is that everyone saw this offensive line betray the Cowboys last December to the tune to 19 sacks in one month. So, what did they do? They signed a Bengals discard and a player who had 1 start in 2011 in Carolina. Then, they hired a new offensive line coach, Bill Callahan, because why? Hudson Houck didn't know how to coach anymore? It reminds you of what they did in the spring after the 2010 season. They hired Rob Ryan to fix the defense, but did not hire new players to actually do it. Presumably, they hired a coach to fix everything by bringing in concepts that had never been conceived. Well, Ryan is fixing the defense, but many of the fixes appear in the form of newer, younger players that arrived 1 year after he did. When he was asked to fix the defense without personnel upgrades (major ones), he had no answers. So, now, Bill Callahan has what is mostly a waiver-wire offensive line. He will get blamed with each sack for not having these guys ready to play. And everyone will hopefully realize how foolish this is. It isn't coaching. It isn't effort. It is, however, another indictment on the continuing failures of this current front office. I am sure when the 2012 season ends, like the secondary last spring, we will hear how fixing the offensive line in 2013 is the top priority. And they will use many of their resources to attempt to do just that. But, why it takes years for them to see things that are obvious to those watching their games remains a mystery. Then, if it is fixed, the shell game of personnel fixes will move to another department of the squad that will be overdue for renovations, too. These are the effects of too many mistakes over the years in the personnel department. The holes out-number the plugs, and before long, you have issues that cannot be addressed because you are out of picks and cap space. Once you leave the port each August for another season at sea, you cannot replenish your supplies until the season voyage is over. Meanwhile, in the middle of it, you are stuck with whatever you took with you. From week to week, as people complain about the coaching and the players, those who remain on the voyage do the best with what they have. But, clearly, what they have is not good enough, and no amount of effort is going to fix the issues for the long-term. So, with the division title within reach and 6 more games to play, the Cowboys take their below-grade offensive line to battle on Thursday. They almost cannot call run plays anymore, nor can they ask their offensive line to pass protect for long. They seem to have dynamic weapons on offense, but barely can use them for fear that the next sack (and perhaps fumble) is a moment away. The Cowboys won yesterday. It wasn't pretty, but they have won consecutive games for the first time since last Thanksgiving week. They are fighting and scratching and clawing out results wherever they can. Like I said, effort and will are not issues with this squad. But, what you see right now is what you get. They are going to battle each Sunday with an offensive line that scares nobody (unless you count those who cheer for Dallas). Until March and April of 2013, this is what they have. They were warned plenty about this issue and largely ignored it last spring, despite people in the league wondering about their logic. They will need to stay out of 3rd and long and they will need Romo to play almost completely mistake-free football. 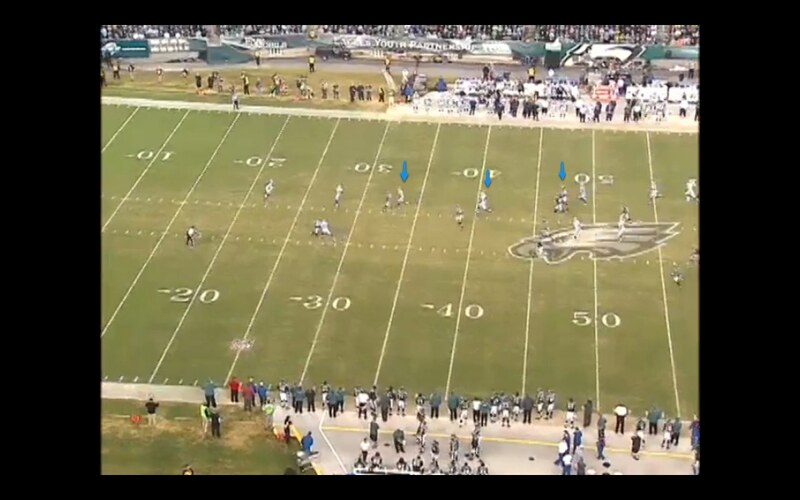 They could use defensive plays that switch momentum and maybe a trick play here and there. Basically, they will need to use smoke and mirrors to figure out how to win 9 or 10 games this season. Because man-for-man, they are trying to overcome a significant disadvantage at the line of scrimmage every time they take a snap. Football is a simple game that is often complicated with strategy. But, at the heart of the matter, can our guys block yours? And can your guys block mine? For Dallas, they are trying to overcome this obvious answer. Even if you are Cleveland. Sunday was quite an oddity for the 2012 Dallas Cowboys. For a team that has almost no success scoring points this season, they were given the gift of help from their defense and special teams. The defense has had a decent year, but almost nothing in terms of takeaways and setting up short fields, or even better, actually putting points on the board themselves. Meanwhile, the special teams have been anything but special. Kick returns have ranked in the bottom third of the league the entire year. Punt returns, through 7 games, showed the Cowboys at 31st in the NFL, with 15 returns for 83 yards (5.53 per) - even though Dez Bryant had a 44-yard return back in Week 3 against Tampa Bay. The average drops to about 2 yards a return if you subtract that one large return. It has just been very difficult to improve the opportunities of the offense if you can never present them with a short field. Jerry Jones, who proclaimed that Dez Bryant and Felix Jones would handle his return responsibilities this year after an equally feeble 2011 from the return game, finally seemed to soften his stubbornness after Bryant in particular went through a few weeks of poor decision making and ball security on punt returns in Carolina and against the Giants. So, to start the Atlanta game, we have seen Dwayne Harris, the Cowboys 6th round pick in 2011, take over the duties, and has shown the same game-breaking ability that he demonstrated at East Carolina as a player who won several honors due to his ability as a return man where he returned over 150 kicks and punts over his 4 years with the Pirates. Compare that to Dez Bryant, who already has more returns in the NFL than he ever did at Oklahoma State or a guy like Cole Beasley who never returned kicks or punts at SMU, and you can understand that Harris might have always been the best candidate for this type of duty. However, in fairness, Dwayne Harris was given opportunities as a rookie in 2011 to return kicks and punts and didn't make much of an impression. It could certainly be the nerves of a rookie who was more focused on not making a mistake rather than trying to make a play, but for whatever reason, his numbers in 15 punt returns last season were that same paltry 5 yards a return. But, in 2012, it appears Harris has a different swagger. Consider the mentality of someone replacing Dez Bryant as a return man. Why was this move made? Because Dez did not protect the ball and make sound decisions. So, you might expect his replacement to go back there and to become a fair catch machine. And yet, Harris has stepped right in and made 2 returns that directly impacted those games and has injected life in the Cowboys special teams. This first one is in the first minute in Atlanta. The Cowboys have pushed the Falcons off with a 3-and-out, and now Harris is back to return this kick which the Cowboys hope to put into a good spot. 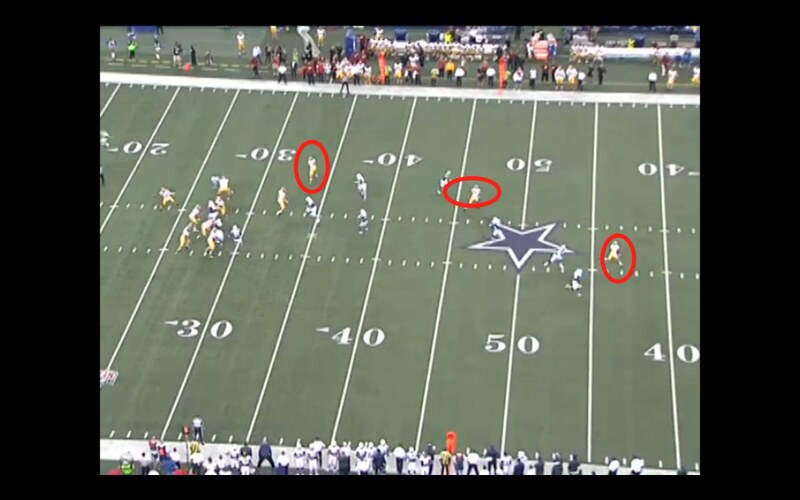 You can see at the punt return formation that the Cowboys are double teaming the gunners on each side of the field and therefore have just 5 players on the inside looking for a fake or a potential block opportunity. This is easily the fewest players you will ever see up on the punt team. This tells us the Cowboys have their best return on. 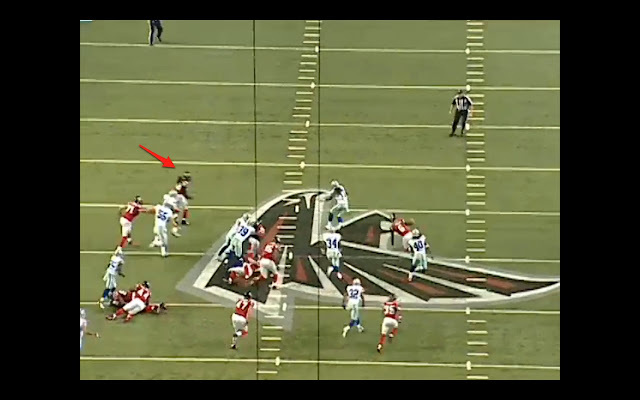 Looking at this Atlanta return on film, it is difficult to see exactly how the Cowboys had this blocked. If it is a return left, you can see a path up the sidelines, but many times your intention is at the mercy of the punter who often steers his punt to set up his coverage team. His punt lands at the blue circle below, and as you can see, Harris has some room here, but there are plenty of red jerseys at midfield or beyond that seem to have a clear path to Harris. But, this third frame is what you really want to see from your return man: North-South running. You aren't going to always have a big play, but if you head north when the opportunity is there, you have an actual chance to get some positive yardage. However, if you go sideline to sideline - or East-West - your valuable cushion of time disappears in a blink of an eye, and you have the dreaded 3 yard return. But, look at Harris. He has darted straight north with great conviction and suddenly, those Falcons who were trying to keep contain on the edges have been left behind and now Harris actually has a path. The punter stands on the logo and already you can see that he understands he might have to make a play here. Right below the blue circle, you can see Atlanta Tight End 87-Tommy Gallarda who also has a clear path to Harris, but his sprawling attempt will not be enough to bring him down. Now, below, please note the red circle around Mike Peterson. I am not sure what opinions you have about Peterson, but my respect for him grew immensely when watching this film. If you go back to previous frames, you can see that he has been occupied by a Cowboys blocker the entire way down the field and did not have great success getting past Orie Lemon. Peterson is a 36 year old veteran who is perhaps best known for his time in Jacksonville and has put in 14 seasons in the NFL. If you know anything about special teams, you hopefully know this: 14 year veterans seldom make great special teams guys. Why? Because it is an awful job that many veterans believe is below them. Peterson has been a top player for a long time, but now is a back-up in Atlanta, trying to part of something special before his career ends. On this night, because Sean Weatherspoon isn't playing, Peterson is starting on defense. But, he keeps his spot on punt coverage. Now, as you look at this frame, do you think a 36-year old linebacker is going to be able to run down a speed demon like Harris? Well, he is going to need punter Matt Bosher to at least slow him down. 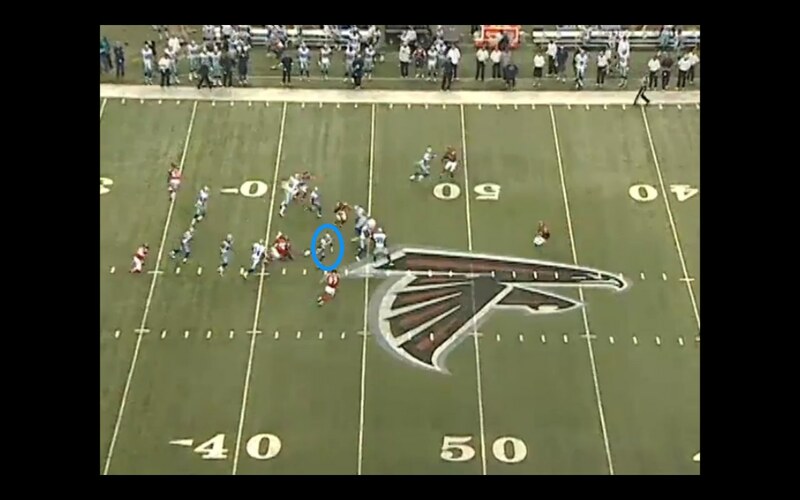 Bosher does that much, but Harris has an awesome spin move at full speed to lose Bosher in his tracks. But, that change of direction leaves an opening for Peterson who is now at full sprint. Again, if this veteran linebacker is not playing as hard as he can, this is a touchdown return. And, this is why veterans cannot play special teams - because too many of them are out there running at 80% and trying to avoid getting hurt. Special teams is for rookies or guys trying to make it in the NFL. A Special teams coach can only put guys out there who are going full tilt. But, look at Harris. He just spun the punter to the ground and has nothing but clear water all the way to the endzone. 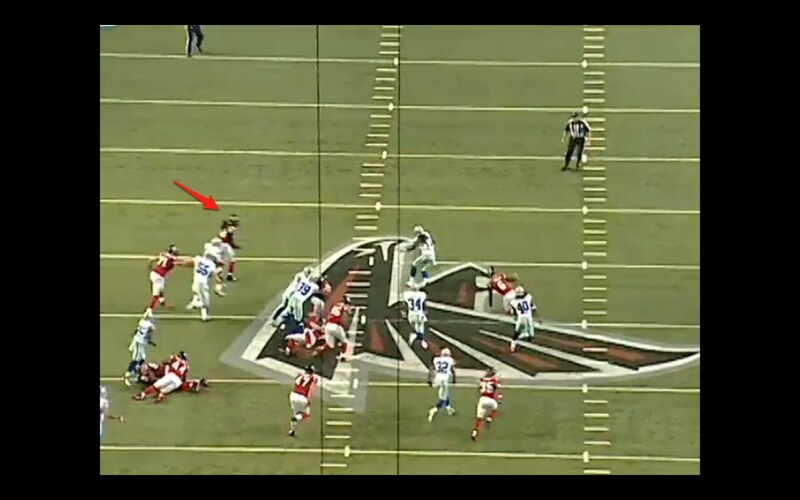 Except, Peterson gets him by the ankles at the Atlanta 33 yard line. It is a great return and a great touchdown-saving tackle by the last line of defense. To see video from NFL.com, simply click on this link. That optimistic return might have been the blind squirrel finding a nut, or it might have been Harris deciding to prove he belongs in the NFL. Either way, the 37 yard return was the 2nd longest Cowboys return since November of 2010. Think about that. Since Bryan McCann's 97-yard return against the Lions back in the early days of the Jason Garrett era. And if you can recall McCann's big moment, it was anything but a traditional punt return. So, could they do it again the next week? Not only could they, but history might claim that it won them the game in Philadelphia and perhaps saved the 2012 season (stay tuned for that). But, here is the return. You can see, that the Cowboys are not quite as feisty in their deployment. Perhaps they think this is a place to look for a block or also to be mindful of a fake from an Eagles team that has nothing to lose, but there is no double teaming the gunners, this time. 7 players on the inside, and Lance Dunbar is Harris' up-man, back at the Cowboys 25. This return is much easier to define, and perhaps could be a text-book example for special teams clinics. Look at the left return set up down the hash marks. As you see every Eagles cover man, there is a Cowboys player at his hip, on his right. 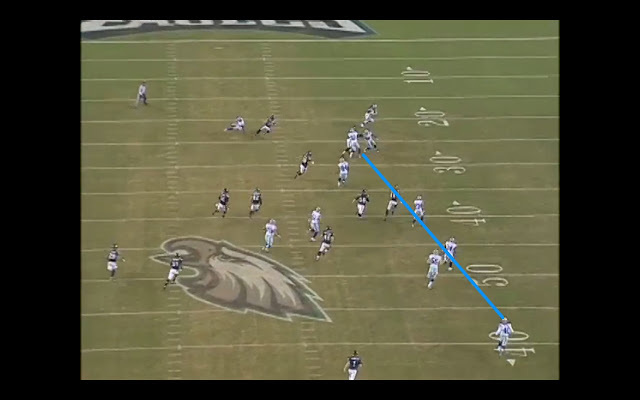 The Eagles are already out-flanked when Harris touches the ball. 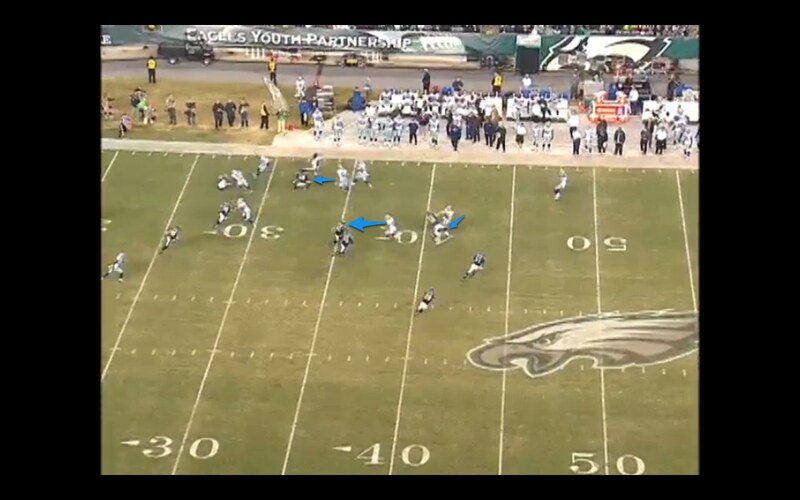 At the 28 yard line, it appears Orlando Scandrick really flirted with an illegal block in the back. In fact, if an Eagles' fan is reading this, it is highly possible that they would argue it was much more than a flirt. But, beyond that, this is about two things. The inside positioning of the Cowboys players - so much so that they almost don't need to do more than retain their positioning, and the breakaway speed of Harris. Depending on your source, you can find Harris running between a 4.38 and a 4.53 in the 40 before the 2011 draft, but here on the video you can see pretty easily that he has the speed to prove that he has plenty of speed when he needs it heading down the sideline. The first return for a TD conceded by the Eagles in 71 games says something. Again, it would be unfair to not point out all of the blockers who make this return so successful. I realize that positive reviews of the Dallas' special teams is a rarity these days, but let's point out a moment of brilliance. It should not be this easy, but the Cowboys have clearly out-flanked the Eagles and Harris has never had an easier path to the end-zone. It looks like James Hanna, Eric Frampton, and Scandrick get the big blocks early, but again, there isn't a whole lot of "blocking" as much as positioning that takes place. They have almost just used inside positioning to seal off the entire side of the field. Now, in the picture below, Danny McCray has to only keep Mat McBriar from ruining the opportunity. Troy Aikman certainly called McBriar out for not doing better here, but I think that was a bit harsh. As you can see, a starting safety versus a punter who really doesn't have a great angle is not a matchup that is going to go the punter's way. It looked feeble in the replays, but really, the Eagles were dead long before the play got to the punter. Even in the frame below, you can see there are almost no Eagles anywhere close to the convoy of white jerseys. The rest is all Harris. You wonder what this does to a career path for a guy who was not assured his roster spot unless he could separate himself from the others at his position on the roster. But, clearly, moments like this make all of the difference. Especially if he shows this 2 weeks in a row. A big play from the special teams can make all of the difference in the world. Not only does it swing the game, but it puts winds in the sails from a morale standpoint. We certainly don't want to suddenly suggest that special teams are now back and a factor, but at least you can see the big play potential again. There seemed to be too much on Dez Bryant's plate, and now he can focus on all of his responsibilities as this team's supposed #1 Wide Receiver. Meanwhile, Harris, who has yet to impact the squad as a wide-out, finds his niche on the team by turning in 2 of the 3 biggest returns in 2 seasons in back-to-back weeks. I am guessing special teams coach Joe DeCamillis is enjoying his week a bit more than usual, for a change. And suddenly, the Cowboys have a little spring in their step.